Eviactive.com Botswana Zambia asounding wildlife and safari camps. Big Five adventures. Accommodations: Tongabezi Lodge is an exclusive property away from the crowds on the banks of the Zambezi River, 15 km upstream from the magnificent Victoria Falls. The small and secluded lodge, set in a tranquil grove of African ebony tree s on a sweeping bend of the Zambezi River, accommodates 18 guests. There are five cottages and four spacious, open-planned stone and thatch houses. All rooms have fabulous river views and en-suite bathrooms. Each house and cottage at Tongabezi has valet service and each valet has in-depth knowledge of Tongabezi and the surrounding area. The camp’s swimming pool is landscaped into a natural cliff and meals are served in the large dining room or on the deck overlooking the river. Following the morning activity (time permitting) and breakfast, guests will be transferred by road to Kasane Airport, for their transfer in a light aircraft to Selinda Camp. This intimate camp offers understated luxury on the banks of the eastern Selinda Spillway – a waterway that links Botswana’s Okavango Delta to the Linyanti and Kwando marshes, rivers and floodplains. Activities in the Selinda Reserve include both day and night game drives in open 4×4 vehicles and game viewing by boat on the Zibalianja Lagoon (subject to water levels). Game viewing is of a high standard, particularly in the drier months and typically seen in the Selinda area are giraffe, baboon, black-backed jackal, elephants, wildebeest, cheetah, crocodile, lion, wild dog, hippo, honey badger, reedbuck, roan, sable and a host of birds. For the more energetic, short guided walking trails are available on request within the vicinity of the camp as well as short mokoro sessions and fishing. The Linyanti area lies to the northeast of the Okavango Delta were the Kwando and Linyanti rivers meet at right angles, forming a swamp area within this triangle. 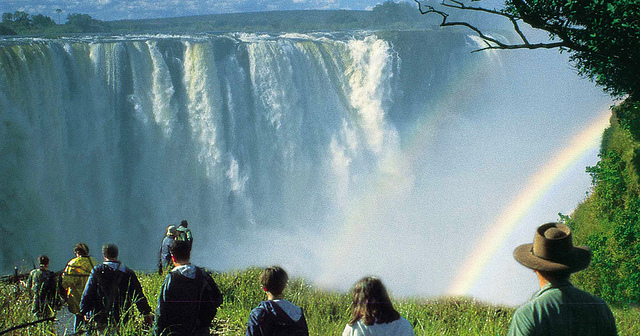 The area’s relative remoteness makes it a favored safari destination. The wildlife in the Linyanti area is spectacular and the region is famous for its enormous herds of elephant and buffalo, which move down to the Linyanti area at the start of the winter months and only move back inland once the summer rains arrive in November. The Linyanti is also known as one of the best wild dog areas in Africa. The rare dogs start denning anytime from June onwards, after which they can usually be found with relative ease for 3-4 months afterwards as they hunt from their den. An abundance of cat species also frequent this area and there is a rich birdlife. Best birding months are between October and January. After an early morning activity (time permitting) and breakfast, we will transfer you from Selinda Camp to Chiefs Camp by light aircraft. You new camp is located in the exclusive Mombo concession of the Moremi Game Reserve. This concession is revered as one of the region’s prime game-viewing destinations and is known as the “predator capital” of Africa. Twelve luxury-tented rooms each offer en-suite facilities and a private balcony. Your comfort is insured with five-star amenities including ceiling fans, mini bars and hair dryers in each room. Electricity is supplied by a combination of a silent packed generator and battery system allowing a 24-hour power supply and communication from the lodge with Internet facilities. The main lodge complex houses the dining area, where sophisticated cuisine is served with African ‘flair’. There is an elegant bar, curio shop, library, and on the lower deck a large swimming pool with views across the floodplains where you will often see elephants at close range. In addition Chief’s Camp features a luxury-secluded spa with a full range of treatments, available for an additional charge. After an early morning activity (time permitting) and breakfast, guests will be transferred from Chiefs Camp to Xaranna Camp by private helicopter transfer for a two-night stay. The camp overlooks one of the permanent lagoons of the Okavango Delta in 25 000 hectares of pristine wilderness. The camp boasts breathtaking views of the channel, providing guests with a water and wilderness experience that combines the best of what the Okavango has to offer. The camp is set in pristine wilderness that is shared by only 18 guests. It consists of nine contemporary safari tents, each with breathtaking views, a romantic sala and private plunge pool. All guest areas are carefully positioned to maximize the sweeping view across the water. An al fresco dining deck ensures the perfect backdrop for all meals. You can opt to have refreshments served while lounging on the plump cushions in the comfort of your own tent. Xaranna offers opportunities to enjoy the delta wilderness, with a selection of game drives, mokoro trips and bush walks available. Huge herds of buffalo, numbering up to 220 individuals from calves to impressive old bulls, are frequently encountered. You experience this irresistible combination of water and wildlife on twice-daily game drives in open 4×4 safari vehicles, mokoro and powerboat excursions. Bush walks provide an opportunity to explore the surrounding areas and encounter animals on foot, while night drives give a fascinating glimpse into the busy nocturnal activities of the Delta. The Okavango Delta is one of the world’s largest inland deltas situated in the middle of the largest stretch of continuous sand in the world – the Kalahari basin. This oasis in the middle of the desert is a rich yet fragile ecosystem, providing a life source for an incredible variety of wildlife. A wealth of species have adapted to the contrasting conditions created by living in the harsh Kalahari desert which is transformed annually with the arrival of the delta flood waters originating in Angola. 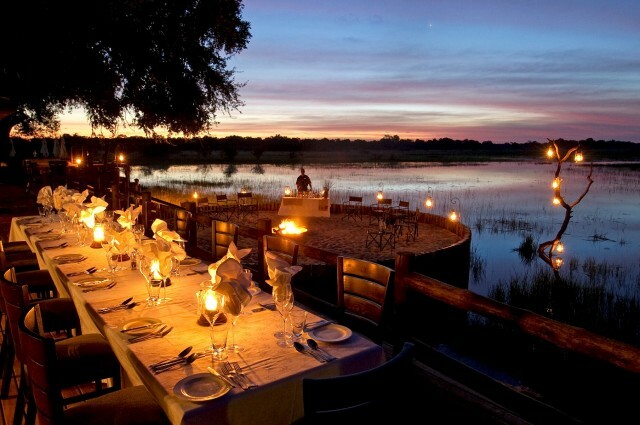 The Okavango wetland encompasses Moremi Game Reserve and surrounding regions divided into private concessions. These concessions are wildlife management areas, carefully administrated to balance the growing community’s development and conservation, while empowering citizens through sustainable tourism. Many of the exclusive lodges in Botswana are situated within these concessions in the delta, providing an unparalleled wildlife experience – exclusive and remote, avoiding mass tourism and exploitation.